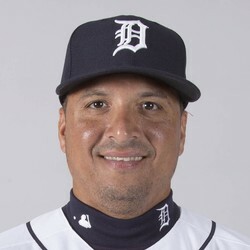 Victor Martinez recorded a first-inning infield single Saturday and was removed for a pinch-runner in what's expected to wind up as his final major-league at-bat. The 39-year-old Martinez struggled this season and it is probably the right time for him to hang up his cleats. The slugger finishes his 16-year career with a .295 average, 2,153 hits, 246 homers, and 1,178 RBI in 1,972 games.